It’s been a hot minute since I’ve done a splurge vs. steal blog post and to be honest, this might be one of my favorite ones yet! One of my GO-TO outfits is always a graphic tee, distressed denim, heels and a classic blazer. It’s easy, stylish, comfortable and you can choose which style you love. Your favorite band tee, a chic french tee or a plain pocket tee…. just add a classic blazer over it, some denim, a heel and you are ready for a girls night out, or for really any event. Want to go more casual?! Switch out the heel for a fun leopard sneaker and you are good to go! If you follow me on Instagram, you know that in about a day, you all sold out this amazing Chloe crossbody dupe bag. It is so so cute and well made in person and I really can’t believe the price tag! I’m watching every morning for a restock, but in the mean time, the bigger version is fully in stock in all 5 colors. If the real deal Chloe bag has been on your wishlist but you don’t want to spend a pretty penny, grab the dupe instead! Another affordable accessory to finish the look is this adorable brushed gold coin necklace for under $40! The coin necklace trend is so so big right now and this one is a great option for layering plus fully in stock (Every retailer keeps selling out of the coin style, so grab one while they are still available). One last great dupe find….these Valentino look-a-likes. But really….don’t they look identical?! And for under $50?! CRAZY. You know what else?! They are so so comfortable (I own them) and they come in 5 colors. 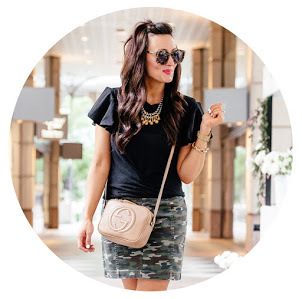 Hoping this gives you gals some designer outfit inspiration on a budget!